Good health is critical for children to grow and develop and for adults to live full and productive lives. We take a comprehensive approach to health. 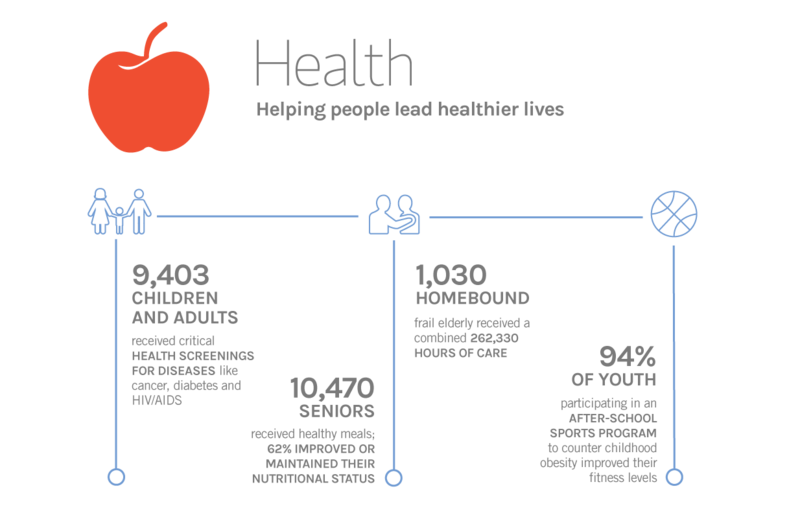 It encompasses access to physical, oral and behavioral health care to addressing the needs of special populations, such as older adults, to promoting healthy lifestyles, the single most important determinant of good health. 40 programs at United Way Impact Partner agencies that help individuals, families and older adults to access quality health services, support healthy lifestyles and increase access to the healthcare system, including preventive health screenings and caregiver support. Through our 11-year partnership with FamilyWize, we’ve helped people save more than $13.4 million mark in prescription drug costs. More than 160,000 people have used the FamilyWize Prescription Savings Card to better manage their health. In collaboration with the Miami-Dade County Office of the Mayor, the Health Foundation of South Florida, and the Alliance for Aging, we authored the Age- Friendly Action Plan for Miami-Dade County, facilitated the adoption of age-friendly county policies, and encouraged municipalities to join the age-friendly movement. Through Golden Wishes, United Way helps fulfill long-held dreams for special older adults by granting wishes and honoring those aged 70 and over.